We’ll be the first to admit it – we’re terrible at drinking enough water! Whether it’s spending too much money on La Croix to motivate and trick ourselves into hydrating or setting timers throughout the day to force water consumption, we usually don’t even make it 50% of the way to the 80-100 ounces recommended daily water intake. Increase energy levels and brain function – there’s a ton of science behind this, staying hydrated actually leads to higher energy levels and better concentration, mood, and memory! That means better workouts, more productive work days, and better/happier days! We’re committing to the September Hydration Challenge. We here at Ocean Simplicity are all taking the challenge to drink at least 64 ounces of water per day (it’s still a bit below the optimal, recommended amount, but small steps! ), and we hope you will join us! To help in our (and maybe your?) 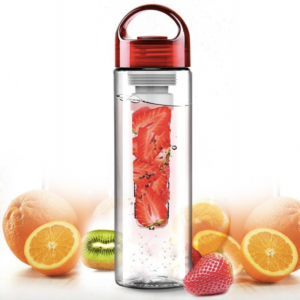 quest, we’ve released the Total Hydration – Fruit Infusion Water Bottle. One of our main challenges is that water just tastes boring, and sometimes we just need a bit more flavor, so we’re taking a leaf out of the spa playbook. The plan is to add slices of our favorite fruits and/or vegetables to our bottle to spruce up our water. Kiwis, strawberries, cucumber, basil, lemons – quick and easy does the trick. So how about it, are you in? I’m in! Get my bottle!